Get the ability to sort orders by product name or by SKU with two new columns added in your Magento. See the products included into an order right on the main grid. We have been using this extension in our store for five years now, and our marketing manager couldn’t imagine her daily routine without it. 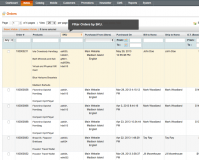 Enhanced Order Filter Magento extension takes order management ease to a whole new level. This simple yet highly useful module allows you to view order content right on the list of orders. It also lets you filter orders by product name or SKU. With its advanced filtering and sorting options, the extension helps Magento admins to navigate through existing order records faster and more conveniently. As a result, it takes less time to find and view details of a necessary order, which makes the overall process more streamlined. A flexible order grid featuring convenient multi-attribute search is a robust tool in the hands of admin users. Not only it allows to get quick access to all the required order records, but also brings more visibility, accuracy, and control, ultimately ensuring better order processing and execution. Enjoy more convenient order filtering. 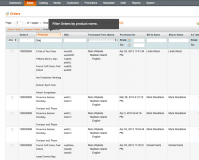 Get Products and SKU columns on the Orders grid. Easily see order content from the order list page. Filter and sort orders by product name or SKU. Use English, German, French, Spanish, Dutch or Italian locales. Magento Order Import extension – transfer orders easily between different versionsin XML and CSV formats. Magento Backorder extension– Allow your customers to place orders for soon-to-arrive items and get paid for them in advance. Magento Order Number extension – set up custom ID numbers for orders, shipping documents, invoices and credit memos. 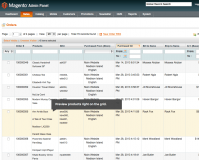 Order Grid Magento extension – Filter order records by product name or SKU and view order-related information right on a single order list page in your Magento admin panel. Magento Recurring orders extension - create grocery lists and place recurring orders for everyday goods. .
* Fixed bug with duplicating associated products' names of a configurable product. * Compatible with Magento 1.6.1.0. * Compatible with Magento 1.6.0.0. Makes it convenient to look up the orders for specific products. Very simple but useful.